Burlington to Vote on School Budget March 6! Have you ever wondered exactly how a school district makes and spends money? 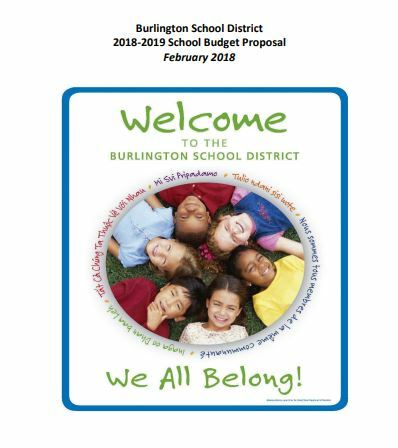 The Burlington School District announced today that they have released a proposed line item budget for fiscal year 2019, as well as a Frequently Asked Questions (FAQ) document related to the budget proposal. Obeng noted that fiscal year 2018’s line item budget has been posted online since early February of last year. He said the document remains available online in case anyone wants to see what the two budgets look like side by side, or just get a reminder of the current year’s goals. “As a school district, we put forth a budget that we feel allow us to stay true to our strategic goals while remaining aware of the challenge rising taxes can put on our community. But at the same time, we also want our community to have the tools they need to make an informed decision when they vote on March 6th. Obeng noted that proposed budget includes “reductions of more than $540,000 from the District’s Central Office and operations, areas that have been cut for the fourth straight year,” as well as cuts to property services, and the restructuring of some high school courses. The proposal also includes investments in multilingual liaison staff, restorative practices work, social/emotional supports, achievement gap strategies, and instructional enhancements designed to revenue to the District. Community members are encouraged to visit www.bsdvt.org/budget to view the documents.